Silent Hill: Origins is a prequel to the first game. When Travis Grady sees the burning Gillespie House, he sees a younger looking Dahlia near the house who slinks away. 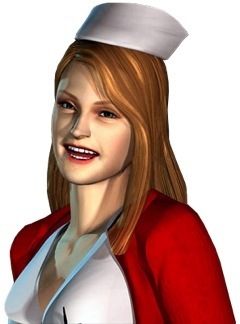 She appears later in the game in the Cedar Grove Sanitarium, telling Travis to quit his quest to help her daughter. As well, she fully admits to burning her daughter. After exploring Alchemilla Hospital, she appears to Travis just before Alessa unleashes all her power on Silent Hill. During the good ending, she and Dr. Kaufmann plot to return the young, pure baby to Silent Hill. Dahlia states that she will use a summoning spell to compel Cheryl to reunite with her other half, Alessa. 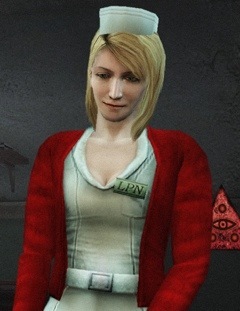 Lisa appears in the prequel game Silent Hill: Origins. Her role as an informant does not change. When Travis Grady wakes up in the reception area of Alchemilla Hospital, Lisa is by his side and she introduces herself as a trainee nurse working in the hospital. Her kindheartedness shows when she persists on asking if Travis is alright. Lisa reveals that Alessa Gillespie had died because of her burns and tells Travis that she has to leave because Dr.Kaufmann requests to meet her at Cedar Grove Sanitarium. At the end of the Otherworld sanitarium level, Travis finds Lisa in one of the rooms sitting on a chair with Michael Kaufmann nowhere in sight. Lisa grieves about a woman who always waits for her son and when Travis asks who it is, Lisa replies sternly, “You KNOW who’s in there!” before running off. In Artaud Theater, Travis finds Lisa sitting on one of the seats in the theater. Lisa tells Travis that since the door was open and because she loves the theater, she had let herself in. She states that she wants to be an actress, but nursing is her family’s tradition. Lisa then playfully flirts with Travis and suddenly backs away, explaining it was her testing out her “acting skills”. At the Riverside Motel, the player can see Lisa’s red cardigan through a peephole in the Rose suite and hear her giggling. When Travis enters the Rose suite through a hole in the ceiling, he discovers Lisa and Kaufmann buttoning up next to a heart shaped bed, implying that they had a sexual interaction with each other and that Travis had disrupted them. Lisa proceeds to leave the room after saying “Travis” in a harsh tone. There is also evidence of White Claudia in the room, meaning that Lisa was hooked on the drug at least 7 years before the events of the first game. As it’s never been explicitly stated whether the Lisa seen in Silent Hill 1 was real or not, it’s impossible to accurately determine what her age would be in Silent Hill: Origins. The Book of Lost Memories stated that Lisa was 23 in Silent Hill 1. If she was real, that would put her age in Origins at around 16 or 17. If she hadn’t been real and instead was “just another part of the town” as has been stated by producers, then the Lisa seen in Origins could conceivably be anywhere from 16 to 23. When Alessa was seven years old, Dahlia became convinced that a certain ritual to summon the cult’s God would likely be a success if she used her daughter as its birth mother. The technique had been performed on other girls that the Order abducted, but all previous attempts had failed. Alessa was offered as a sacrifice by Dahlia to the God on the second floor of their house by immolating her body. Despite the interfering actions of Travis Grady, the plan was a success, with Alessa becoming pregnant with the deity in embryonic form. Dahlia fled the scene of the fire and people believed that she became crazy due to Alessa’s supposed “death”. After Travis saves Alessa from the house, Travis faints and the Order takes Alessa’s body to a secret ritual site located in Dahlia’s antique store. Alessa uses astral projection to guide Travis through the town. Alessa gives hints to Travis to help her to create the Flauros, an artifact that would “trap” the evil side of her. Alessa seems a little indifferent to Travis throughout the game, even when he helps her continuously, she remains quiet. Though Travis becomes angry with her, she continues to use him for her plans. She later appears at the end of the game, holding a baby in which she is then reincarnated, when Travis is finally able to get back into his truck in the good ending. 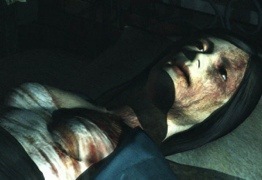 Alessa’s other half is then found by Harry Mason and his wife on a road outside of Silent Hill. They named the baby Cheryl and begin to raise her as their own daughter. “	The fire in the business district? How awful. I heard about that. No one knows how it got started. And that poor girl, Alessa Gillespie… To die like that. Due to the ritual’s fire, Alessa had received many burns on her body. 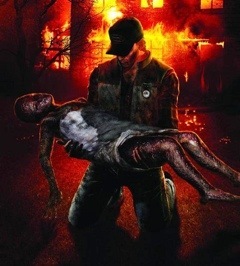 The ritual performed by Dahlia was kept secret and the residents of Silent Hill assumed that the Gillespie’s house burned down due to an antiquated boiler. Alessa was then taken to Alchemilla Hospital and was hidden inside a room in the hospital’s basement by Dahlia and the director of the hospital, Michael Kaufmann, who had an alliance with her centered around drugs. To the public, Alessa was thought to have died in the fire, and was declared a “saint” by the Order as the “Mother of God and Daughter of God”. Only Dahlia, Michael, a few members of the Order, and a young nurse working at the hospital knew that Alessa was still alive. The young nurse, Lisa Garland, often cared for Alessa and in return, was supplied with drugs from Michael Kaufmann. “	That child…that demon… When I think of the endless pain it will bring when it is birthed… I decided that, instead of the suffering and cruelty I endured in that sick room, that I would like to bestow a more gentle and peaceful death on “myself”. —Alessa’s thoughts on God and Heather. Although the God was inside of Alessa’s womb, Alessa was unable to deliver Her. Every day was driving Alessa mad with suffering, as “God” was eating away at her from within. Dahlia had kept Alessa alive using a magical incantation. Alessa suffered a fate “worse than death”, described as being trapped in an endless nightmare from which she never awakened. Alessa wished that she would die and end her suffering, however, the nightmare continued for seven years. At the age of fourteen, Alessa was eventually saved by Harry Mason. 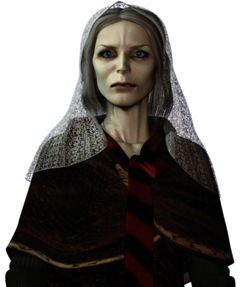 Helen Grady is a character from Silent Hill: Origins. Having presumably died at some point prior to Silent Hill: Origins, Travis Grady encounters the remnants of his mother while exploring the depths of Silent Hill’s Cedar Grove Sanitarium. The mother of Travis and wife of Richard Grady, Helen attempted to kill both herself and Travis during his childhood. When police asked her why she would do such a thing, she claimed that the “people in the mirrors” told her to “kill the devil child.” Helen was committed to Cedar Grove Sanitarium shortly after the incident. On numerous occasions, when Richard would visit, she would become extremely violent, demanding to see her son. This lead Richard to tell Travis that his mother had died, to keep his son away from the mother’s terrifying grip. During the time of her institutionalization, she also may have met Dahlia Gillespie. Helen kept going on about the “people in the mirrors” as doctors asked questions in order to check her mental state. She claimed (as heard in a cutscene) that she could go back and forth between worlds as much as she pleased and there wasn’t a thing the doctors could do about it. As time passed, however, she gained full knowledge of her actions and even seemed proud of her attempt on Travis’ life. 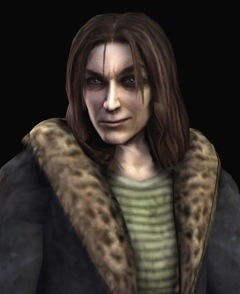 Richard Grady is a character from Silent Hill: Origins. 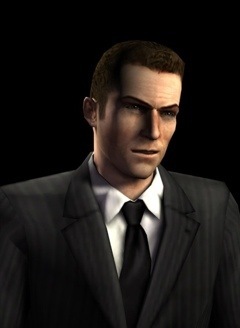 Having killed himself some years prior to Silent Hill: Origins, Richard Grady’s presence is not encountered until Travis Grady explores the expansive Riverside Motel. The father of Travis and husband to Helen Grady, Richard was left to raise their son on his own shortly after Helen was committed to the Cedar Grove Sanitarium for attempting to kill Travis and herself. Richard and his son would stay at the Riverside Motel from time to time to visit Helen. Before Richard would go to see his wife, he gave young Travis some change and told him to go play in the arcade room and to wait until he returned. On one such occasion, Richard told Travis to go to the arcade room as usual. An overwhelming sadness, resulting from the loss of his wife, and a final meeting with “the ghost” drove him to his breaking point and he hung himself from the ceiling in Room 500, with his son completely oblivious. When Travis returns to Room 500, discovering his father’s body, he is reluctant to believe his father is dead, and so remains with his father, convincing himself that his father is just asleep. Both Richard and Travis are discovered by the hotel manager 10 hours later, and immediately calls the police. Happy? You dug up my parents, what now? When do we get to look inside your sick little mind? Travis Grady is the protagonist of Silent Hill: Origins. He is a troubled truck driver with a dark past. Travis is running late on a delivery and decides to take a shortcut through the town of Silent Hill. In doing so, Travis remembers the horrible tragedies that took place years ago. Travis was born to a married couple named Richard and Helen Grady. During Travis’ early childhood, his mother started suffering from worse and worse mental delusions, claiming beings from a mirror world told her that her son was a devil child, ending in her attempt to try to gas herself and Travis (which could explain his shortness of breath after a prolonged period of time. However, he also states that he is a smoker, “I only smoke when I am happy.”) Police broke into the house and both were moved to the hospital, and Richard later transferred Helen to the Cedar Grove Sanitarium, which is an important location in game. While she was there, Travis, missing his mother, sneaked into the Sanitarium, most likely to give her the “Daddy, Momma & Travis” drawing found there later. However, Travis was found, and was brought home by his father. The two of them later checked into Riverside Motel, and Richard, on the advice of a doctor, told his son that his mother had died, but kept writing letters to her. Richard, while at the motel, moved deeper into a deep state of depression and finally hanged himself in Room 500. Travis, having been out playing at the motel’s arcade during his father’s suicide, locked himself in the room with his father’s corpse and stood there talking to it until the cleaners found them the next morning. After this incident, what happened to Travis afterwards in his childhood is unknown, but this most likely would have taken a heavy toll on his sanity and may allude to his questionable past. At the time of Silent Hill: Origins, Travis is a truck driver in his mid 20s, haunted by nightmares of his past. On a routine drive one day, he ends up passing through Silent Hill. Driving on an unusually foggy road, he immediately stops his truck to prevent hitting an unknown bystander. Upon getting out of the truck, he notices the person is gone. This is the same predicament Harry Mason was in, in the first installment. Trying to find the person, he wanders down the foggy road on foot, eventually coming to a burning house. He briefly sees Dahlia Gillespie skulking in the shadows, but she backs away. Making his way through, he finds the charred and badly burnt body of Alessa Gillespie. He carries her body out of the house, and shortly after, passes out in the front yard. He wakes up on a park bench in Silent Hill itself, and left to make his way to Alchemilla Hospital to inquire about Alessa’s health. Shortly after entering he meets Michael Kaufmann and Lisa Garland. He soon encounters an unharmed Alessa behind a large mirror, which she “teaches” him how to use; by touching the mirror with his hands, he himself can shift the town into its foggy and hellish counterparts. He travels through the town, the Sanitarium, the Riverside Motel, and more locations, discovering that his father committed suicide and that his mother went insane and was placed in the Sanitarium. Much like James Sunderland had Pyramid Head to represent his emotional torment, Travis has an entity known only as “The Butcher” to represent his inner demons. The Butcher’s helmet covering only half of his face suggests a split personality (It could be hinting as Alessa splitting her soul in half or Travis himself having a battle against his own personal demons). Travis defeats the evil incarnations of his already-deceased parents, and defeats The Butcher as well, finally gaining solace from his past. Due to his troubled past, Alessa targets Travis as her unwilling aid in fulfilling her desire to prevent the birth of God. Travis unknowingly helps her by traveling throughout the town and collecting the Past, Present, Future, Falsehood, and Truth pieces of the Flauros, which have the power to expel the Demon at the climax of the story. Although Travis wants to leave the town as quickly as possible, he later realizes the importance of his role and stays to finish his job of his own free will. Depending on the ending the player activates, Travis receives a different fate. In the canon Good Ending, he successfully defeats the the Demon, and Alessa is pleased. She splits her soul in half, which is noted to be the birth of Cheryl Mason, (who would later be called Heather Mason,the main protagonist in Silent Hill 3.) Travis is then seen walking on the outskirts of the town, towards his truck. The sky is blue with clouds and relatively little fog, indicating the area he is in is not in the area of influence of Alessa or Silent Hill, or that Alessa has reverted the town back to normal. As he gets in, he sees a contented Alessa with the baby who stares happily at him in the rear-view mirror of his truck. Travis resets the meter that shows the mileage, which represents him starting over anew. The Bad Ending, which is obtained by defeating more than 200 enemies on a second playthrough, shows Travis restrained to a table in a relatively dark room, while cult members inject an unknown liquid into him. Images of the Butcher flicker on and off as he lays on the ground staring at his bloodied hands. Sound clips of unknown people screaming in pain can be heard, with one person saying “I’m not your momma!”. This indicates that the Butcher may have actually been another identity of Travis, as Travis possibly was a serial killer in his past or killed before; even being responsible for the death of his father. The Crime pictures that he collects through the Riverside Motel maybe an indication of Travis being a serial killer, possibly that he’s the one who committed those crimes. He also appears in the traditional UFO Ending, which is drawn in a cartoon style similar to Silent Hill 3’s. In this ending, Travis tries to enter a certain apartment room before the end of the game. However, after trying to unlock the door using its key, he realizes that it doesn’t fit. Travis takes a brief moment to enjoy the moon when suddenly a UFO descends with Mira and an alien. Travis asks the pair if they have seen his truck. They claim it is on their home planet and ask him to go with them. Travis asks if he can drive and the alien asks if he can drive “stick”. He joins them on the ship and they leave Silent Hill. Upon entering Alchemilla Hospital near the start of the game, Travis Grady encounters Kaufmann near the Elevator. Travis questions Kaufmann on the condition of the girl, but Kaufmann denies any knowledge of the inicident. Tiring of the conversation, Kaufmann leaves in an elevator, taking it to the second floor, the only floor accesible at this time. Upon entering the lift after Kaufmann leaves it, clues indicate the girl was in the hospital, such as a gurney in the lift with fresh blood on it. Later when Travis reaches the Riverside Motel, upon entering the Otherworld, Travis hears a “sexual encounter” between a man and a woman through a hole in a motel room. Jumping through a hole above the room, Travis stumbles upon Kaufmann and Lisa Garland, both of whom appear to be in the midst of finishing redressing. 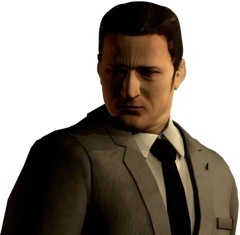 Kaufmann then voices his impatience at seeing Travis still in Silent Hill, having recommended he leave during previous encounters. Once alone in the motel room, inspection shows the presence of white powder, possibly the drug White Claudia that Kaufmann deals in, in the bathroom and on a mirror in the bedroom. Kaufmann makes another appearance before the game’s final boss, in which he gasses Travis before he can interrupt the cult’s ceremony. Upon the defeat of the boss, when the flauros seperates the baby from Alessa, he is seen escaping the room as this occurs.